The greatest value of forecasting with KPIs is not predicting the future; it’s discovering the leverage to create it. 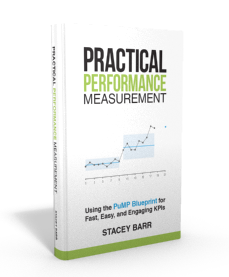 The purpose of measuring performance is to guide our decisions to get better results. Forecasting gives us an estimate of how our past or current decisions are mostly likely to affect those results. Forecasting is a type of prediction or estimation of a future result. We can’t know the future, obviously. The world is neither predictable, nor unpredictable; it’s somewhere in between. That’s why we can learn from the patterns we experience, observe or measure. From these patterns, we can forecast how likely certain results might be in the future. At least for KPIs or performance measures, that is the most useful context for forecasting. 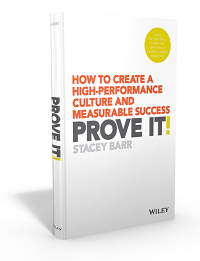 Forecasting KPIs and performance measures is about finding leverage. Forecasting is not about prediction, the way a crystal ball or psychic has us thinking about prediction. The future isn’t yet known, and it’s not fully beyond our influence either. And that’s why building a forecasting model for a KPI or performance measure is so useful: it helps us discover the influence we can exercise. Forecasting a KPI helps us find leverage to improve that KPI’s results. Forecasting is fundamentally about building a model. Imagine we want to forecast the demand experienced by an animal referral and emergency centre. Anticipating demand more accurately would help us set the right staffing levels, stock enough of the right equipment and medicines, and schedule shifts to reduce the time that sick or injured animals wait for treatment. Essentially, a forecasting model is a quantitative (or at least logical) description of the relationships between the explanatory factors and our KPI. Start with a quantitative measure of the result. Then, we need to find out the factors that drive this demand; that influence how many patient visits the centre gets in a week. Then, research and choose the factors that influence the result. researching what others have found for similar KPIs or measures. Using techniques like these, what might drive the demand on our animal referral and emergency centre? The centre’s Results Map might suggest that word of mouth referrals between clients is a driver of demand, so a measure of the percentage of new visits from referring clients might be one explanatory factor. Looking for correlations with a bunch of data the centre has collected, like customer reviews (like on Google), repeat visits from clients, and new website visits. Research suggests factors like these: rates of pet insurance in the community, percentage of pet owners in the community, pet owners’ awareness of veterinary care available. AI (artificial intelligence) will likely help us with these tasks in the future, mostly due to its ability to process a lot of data rapidly, to see patterns humans might not, and to be objective and consistent. Next, gather the data and information for the result KPI and the influencing factors. To build a quantitative model to forecast our KPI, we need historic data. It’s patterns from the historic data that then get quantified into a predictive formula. Clearly, the more historic data we can find about our KPI and measures of it’s influencing factors, the more accurate our forecasting model can be. Even when we can use AI, this data is what we’d feed it, so it might build a model for us. Finally, build the forecasting model. There are several different approaches to build a forecasting model for our KPI (or dependent variable). They each have their advantages and disadvantages. A very good overview of the range of forecasting methods, both quantitative and qualitative, is in a rather old but timeless HBR article, “How to Choose the Right Forecasting Technique”. We need to be very clear and open about our assumptions when we choose a forecasting technique. For example, if we choose trendline extrapolation, we’re assuming that the passage of time is the only explanation for our KPI’s values. We don’t have to rely on a single forecasting technique. We can combine several, like using expert consensus in combination with a multiple regression analysis. We should remember that things we try to forecast are often the product of very complex systems, and there will always be blindspots and inaccuracies in our forecasts. If we take an action or make a choice based on a forecast, we’ve made the forecast less accurate. We’ve changed the future through our action or choice. This last point is my favourite, because it points directly at the most important reason to forecast our KPIs. Use forecasting to influence the future, not predict it. When we have a forecasting model for our KPI, we can use it by plugging in information about how our predictive variables might change into the future. Are there any certain changes coming up in those predictive variables? For example, is the centre doing some new marketing that is growing website traffic, or is there an increasing trend in 5-star reviews on Google? Then the model can show us what change our KPI might experience as the influencing factors change. When we think about how to forecast a KPI, what factors influence the values of a KPI, how to use those factors to predict the values of a KPI, we discover the leverage to improve the KPI. We don’t really want to know the future. We want to create it . We forecast with KPIs not to predict the future but to discover how to create it, by finding the factors that most influence it.